In addition to diet and exercise, to improve glycemic control in adult patients with type 2 diabetes. Not for type 1 diabetes or diabetic ketoacidosis. We appreciate your interest in the dosing information for TRADJENTA. TRADJENTA is the only single-strength DPP-4 inhibitor that requires no dose adjustment regardless of renal function. Please see below for additional details. When TRADJENTA is used in combination with an insulin secretagogue (eg, sulfonylurea [SU]) or insulin, a lower dose of the insulin secretagogue or insulin may be required to reduce the risk of hypoglycemia. References: 1. Bailey RA, Wang Y, Zhu V, Rupnow MF. Chronic kidney disease in US adults with type 2 diabetes: an updated national estimate of prevalence based on Kidney Disease: Improving Global Outcomes (KDIGO) staging. BMC Res Notes. 2014;7:415. 2. The National Kidney Foundation Kidney Disease Outcomes Quality Initiative (NKF KDOQI). 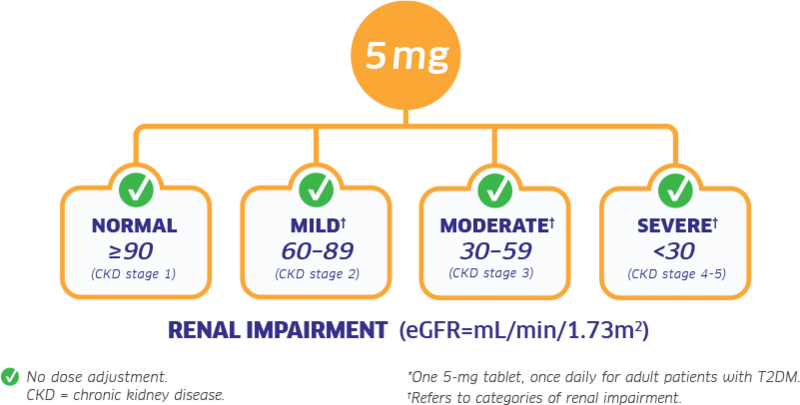 “How to Classify CKD.” kidney.org. 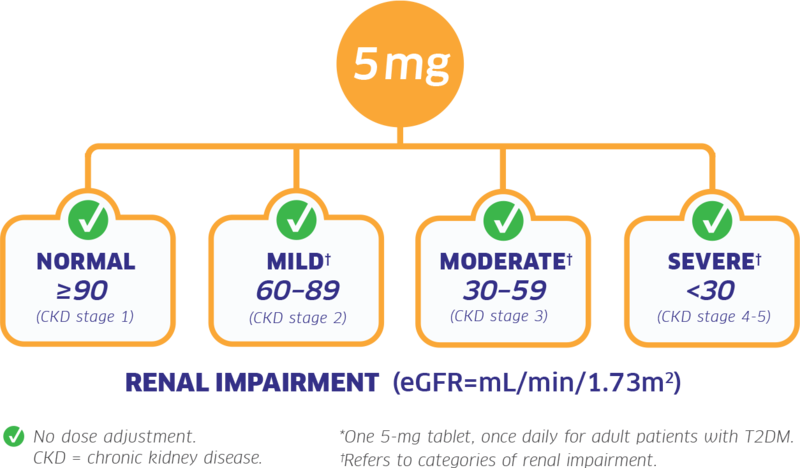 https://www.kidney.org/professionals/explore-your-knowledge/how-to-classify-ckd. Accessed on September 18, 2018. TRADJENTA is contraindicated in patients with a history of hypersensitivity reaction to linagliptin, such as anaphylaxis, angioedema, exfoliative skin conditions, urticaria, or bronchial hyperreactivity. Acute pancreatitis, including fatal pancreatitis, has been reported in patients taking TRADJENTA. Take careful notice of potential signs and symptoms of pancreatitis and, if suspected, promptly discontinue and initiate appropriate management. It is unknown whether patients with a history of pancreatitis are at increased risk for the development of pancreatitis while using TRADJENTA. TRADJENTA is indicated as an adjunct to diet and exercise to improve glycemic control in adults with type 2 diabetes mellitus. TRADJENTA should not be used in patients with type 1 diabetes or for the treatment of diabetic ketoacidosis. TRADJENTA has not been studied in patients with a history of pancreatitis, and it is unknown if using TRADJENTA increases the risk of developing pancreatitis in these patients. Heart failure has been observed with two other members of the dipeptidyl peptidase-4 (DPP-4) inhibitor class. Consider the risks and benefits of TRADJENTA in patients at risk for heart failure, such as those with a prior history of heart failure and a history of renal impairment. Monitor patients for signs and symptoms. Advise patients of the symptoms of heart failure and to immediately report such symptoms. If heart failure develops consider discontinuation of TRADJENTA. The use in combination with insulin or insulin secretagogues (e.g., sulfonylurea) increases the risk of hypoglycemia. A lower dose of insulin or insulin secretagogue may be required. Serious hypersensitivity reactions have been reported in patients treated with TRADJENTA including anaphylaxis, angioedema, and exfoliative skin conditions. Onset of these reactions occurred within the first 3 months after initiation of treatment, with some occurring after the first dose. If a serious hypersensitivity reaction is suspected, discontinue, assess for other potential causes for the event, and institute alternative treatment for diabetes. Angioedema has also been reported with other DPP-4 inhibitors. Use caution in a patient with a history of angioedema to another DPP-4 inhibitor because it is unknown whether such patients will be predisposed to angioedema with TRADJENTA. Severe and disabling arthralgia has been reported in patients taking DPP-4 inhibitors. 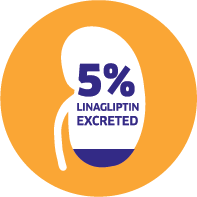 Consider linagliptin as a possible cause for severe joint pain and/or disabling arthralgia and discontinue, if appropriate. There have been reports of bullous pemphigoid requiring hospitalization in patients taking DPP-4 inhibitors. Tell patients to report development of blisters or erosions. If bullous pemphigoid is suspected, discontinue TRADJENTA. There have been no clinical studies establishing conclusive evidence of macrovascular risk reduction with TRADJENTA. The efficacy of TRADJENTA may be reduced when administered in combination with a strong P-gp or CYP3A4 inducer. Alternative treatments should be used. Use during pregnancy only if clearly needed. Exercise caution when administering to a nursing woman. Reference: 1. Bailey RA, Wang Y, Zhu V, Rupnow MF. Chronic kidney disease in US adults with type 2 diabetes: an updated national estimate of prevalence based on Kidney Disease: Improving Global Outcomes (KDIGO) staging. BMC Res Notes. 2014;7:415. TRADJENTA is a registered trademark of Boehringer Ingelheim International GmbH & Co. KG and used under license. Copyright © 2018 Boehringer Ingelheim Pharmaceuticals, Inc. All rights reserved. Use of this Site is subject to the Internet Site Legal Notices and Disclaimers and Privacy Statement. Working hard to make our medicines available to people who need them.